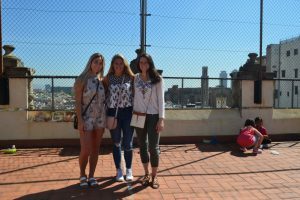 We caught up with SAI Barcelona team members Leticia, Ashley and Sandrine, who provide some ideas on immersing yourself into the local scene. 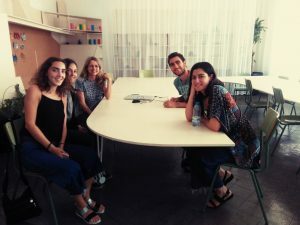 Being a team who is always looking for that off the beaten path adventure, from our personal experience, in order to get the true flavor of Barcelona, the best way is to get involved in the community. Spain is one of the most generous and hospitable places and, Catalans are as well if you make a small effort to learn about their history and culture. Due to previously living in different countries, we have become somewhat flexible to cultures, and local traditions. One of the most important things we have learned, residing abroad is to be proactive, brave, and have fun! It is all what you make of it! In Barcelona, being that it is a cultural mecca, there are so many opportunities where one can feel part of a community. For us, the sensation of being part of a something greater, giving back, and also where connections are made; is indescribable. And you will see: participating in Volunteer Programs and see the children faces light up is something you will remember all your life. This is the reason why we always look for volunteering/exchange options. We offer, for example, the opportunity to volunteer at two primary public schools working with children from 6 to 12 years old. One of the schools is located close to Sagrada Familia and the other is one of the first public schools in Barcelona. 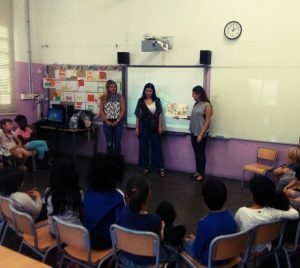 Volunteering at a primary school, you will be able to participate in the classrooms such as play with the children, sing, bake cookies, play games, play sports in English, and participate in Saint Patrick’s Day. The volunteer program provides an experience where both parties get to take a piece of each other’s culture. Working with children you will soon see that most of the primary students are fascinated with the idea of learning a foreign language and, more importantly, absorbing bits and pieces of a culture that is different from their own. Being that most of the younger generation are or have been in contact with the U.S. culture, be it via television series or Hollywood movies, they still have an urge to learn more! During the academic year, there are many American or English traditions that have slowly been grandfathered into the academic school program to spark an interest in learning English and make something hard seem a little bit easier! 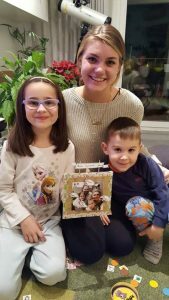 We also have a very special exchange program with a local family. The idea is to meet once every two weeks and be part of the family’s routine during the semester. 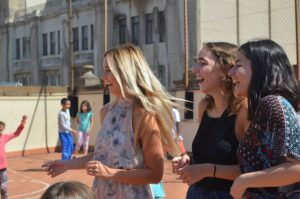 In our adoptive family exchange program, the interaction is greater than our students could have ever imagined: The family gets to spend time with the students and in exchange the student gets to experience a typical Catalan dish. In past semesters, it often occurred that our students took part in a local theatre or cultural event where the exchange was mutual and diverse! If you can imagine, playing games with a younger student who has just began their journey of learning English, many laughs will be had for sure! The beauty is both get to learn from each other whether it be young or old. In some other ocasions, we had architecture students involved in our school volunteering program and as there was a very special architecture project in the school. 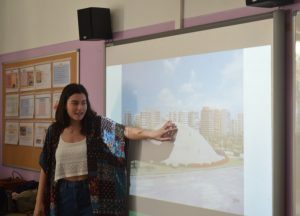 We had organized a meeting with the architect who had coordinated this project for her to speak about the reasons why she had decided to have this new classroom concept within the school, the material she used, how she managed to find the resources for the construction of the classroom. 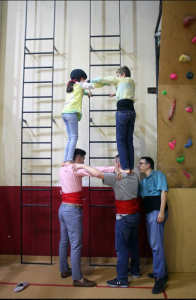 We have also organized Human Tower workshops for our students to learn about this great Catalan tradition and have the opportunity to participate in one of their rehearsals. Check out this video and you will see our Spring 18 students in action! Any excuse is a good excuse to immerse into a new culture, be part of the community and get the chance to learn more about the culture and go back with a memorable experience and networking!